The righteous people are expected to remember Allah in all three cases. And standing is mentioned first because that is the stage they strive for the most (via Prayer) and if they can’t due to sickness they will remember Allah via sitting and then via lying on their sides. There are also other ways they remember such as the Dhikrs done sitting, after Prayer. Remember the hadith where our Prophet (SAW) went to Ali and Fatima while they had already lied in their bed and told them not to get up and say the three different Dhikrs? That is why the word ‘wa’ = ‘and’ is used by Allah. It is used to indicate that all situations are aimed for. For the transgressor who only calls Allah when a calamity occurs; he will call Allah on whatever situation; whether he is standing (eg he is witnessing a tsunami in front of him); whether he is sitting (eg in a plane and it is about to crash); whether he is lying on his side (eg informed by a doctor that he is about to die). No matter the situation he calls Allah; if he is saved in that situation he will not go on remembering Allah in other situations and that is why the word ‘au’ = ‘or’ is used by Allah. The fact that the lying on his side is mentioned first indicates that they really have to be in a very tight spot to start calling Allah. Note: We have noticed in Surah Yunus that there are many references urging one to believe as soon as possible. We also want to highlight that the righteous people are shown to remember Allah (i.e dhikr of Allah) which obviously leads to Prayer and other good deeds (eg taubah, charity etc). While the transgressors only call on Allah which indicates that they remember Allah very little which is a characteristic of the hypocrites and disbelievers. Though it should also be noted that Allah responds to the call of the caller when he calls on Allah as seen in (Qur’an 2:186). The remembrance of Allah is so great that Satan tries to avert you from it first before Salah as seen in (Qur’an 5:91). Remembrance of Allah gives the hearts assurance/peace as seen in (Qur’an 13:28). Remembrance of Allah is a characteristic of the believers as seen in (Qur’an 33:41). If you are blinded from the remembrance of Allah you will have a devil as your companion as seen in (Qur’an 43:36). See also (Qur’an 2:200) and (Qur’an 29:45). Please note that you cannot attain perfect remembrance of Allah if you do not pray; even Musa who spoke with Allah and heard Allah was told to establish prayer for the remembrance of Allah as seen in (Qur’an 20:14). If even Musa who heard Allah and had a better chance of remembering Allah was told this what about you and me? Even Prophet Muhammad (SAW) was told to establish the prayer to remember Allah multiple times in the Qur’an despite the Night Journey. No matter how high your faith is; you have to strive to establish the prayer because even Ibrahim in his very old age after being granted Ismail and Ishaaq (Isaac) still prayed to Allah to make him an establisher of prayer as seen in (Qur’an 14:40). That is why in (Qur’an 3:191) it just mentions remembering Allah despite being in the prayer or out of the prayer while in (Qur’an 4:103) it necessarily shows that only after praying will you have a better chance of remembering Allah. Therefore always remember that remembrance of Allah leads to prayer and prayer leads to remembrance of prayer and without sincere remembrance of Allah the prayer becomes almost worthless if not completely worthless. Cause even the hypocrites can come to the prayer though they will be in the lowest depths of Hell. So woe unto those performers of Salat (prayers) (hypocrites), who delay their Salat (prayer) from their stated fixed times, those who do good deeds only to be seen (of men), and refuse Al-Ma’un (small kindnesses e.g. salt, sugar, water, etc.). (Qur’an 107:4-7). 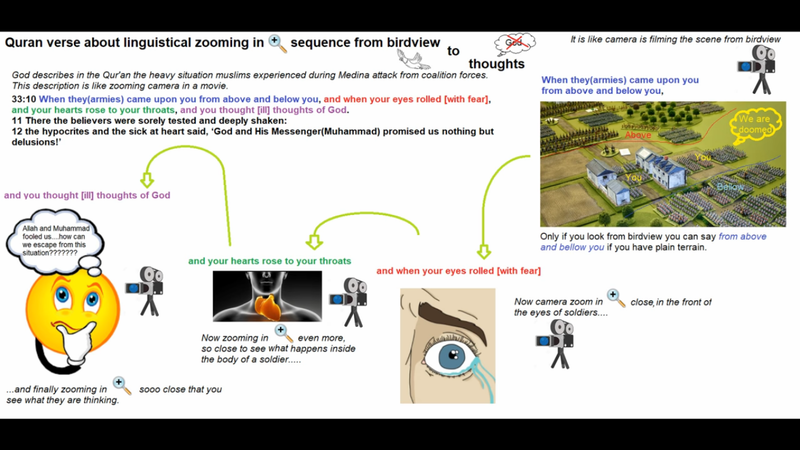 These different view transitions can be seen in a certain Ayah of the Qur’an. One favourite example of this kind of motion imagery in the Qur’an is in Surah Al-Ahzab. See what Allah says in (Qur’an 33:10); one Ayah, look at the different angles. The Muslims are surrounded in the Battle of the Trench, the enemies are coming from two sides. North and South. Allah says they came at you from above you and below you. Now the problem with saying that is if you are on the northern border, you can only see the army coming from there. If you are on the southern border, you can only see the army coming from there. You cannot see both ends of the army coming at the same time. The only view that can give you both approaching at the same time is what kind of view? It is an aerial view (or bird view). Allah provides the aerial view first. The armies are coming from both sides. But then that camera moves in. It moves in so close that He, says, “..and when the eyes shifted [in fear],…” .When the eyes were petrified. You wouldn’t even blink. You saw the armies coming and you were like…How close is the camera? That’s pretty close! That’s all the way to the face! Allah can tell that you are not even blinking. Then He says, now look at where the camera is going to go: “…and the hearts reached the throats,…” And your hearts were jumping up to your throats. The camera went even closer, huh? What is going on inside of you? ‘Heart beat!’ ‘Heart beat!’ ‘Heart beat!’! The camera goes deep inside your soul. “…and you assumed about Allah [various] assumptions.” And you were making all kinds of assumptions about Allah. You were having all kinds of thoughts about Allah. Allah even recorded your thoughts. The sequence of this Ayah is a view of what? An aerial view of two armies; it went to the face; it went to the heart; it went to all kinds of thoughts being had. And you know what is beautiful? In the Ayah right before, Allah says, “And Allah is Ever All-Seer of what you do.” Allah was watching with full view what you were doing; and in the next Ayah, He shows us a piece of what His Full view is like. Please note that we will not be uploading new content from today as we are currently working on a project which is consuming a lot of our time and we believe that if eat more than we can chew we will mess up both the project and the materials we place here. Therefore we will start posting new materials on 1st Muharram 1441 In Shaa Allah which is around 1st September 2019. We understand that it is a long time but it is necessary at this point. It is also why we have not been able to upload any new content since 27th April 2018; 10th or 11th Shaban 1439. In the mean time please go through the materials and let us know if there are any mistakes and if you like and double checked our content and found them to be okay; please share them.